What Medical Conditions Can Weighted Blankets Help? People with insomnia are turning to weighted blankets to help them get better sleep. Weighted blankets are filled with balls, pellets, or chains which give these fabrics their hefty weight. Those who have tried them often find that the pressure coming from the blanket makes them feel that they are being hugged, thus giving the term “comforter” a whole new meaning. The desire to sleep under a weighted blanket has appeal, especially to those who are struggling for a comfortable nights sleep. Heavy, weighted blankets are fast becoming popular in many health and wellness circles because of the hope that they can help reduce anxiety and insomnia. There’s no de facto standard for the filling materials used to create the dense covering blanket. You will find weighted blankets ranging from 10 to 30 pounds for adults. The difference between a weighted blanket and a traditional comforter resides in both the bedding sizes offered and physical weight. 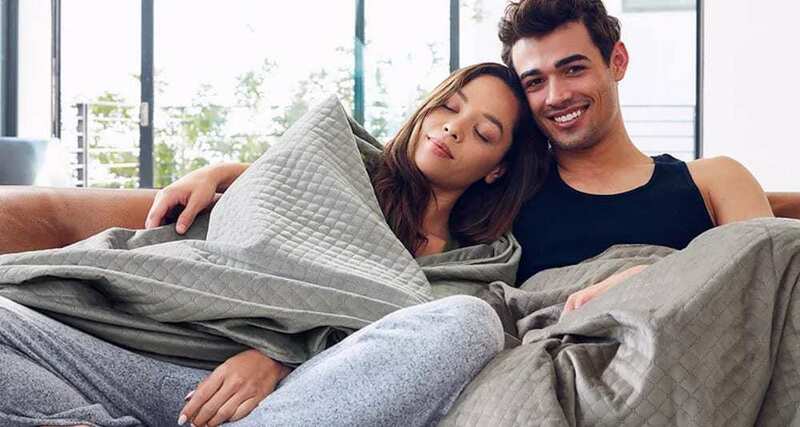 A weighted blanket is not designed to replace your traditional comforter but instead used in conjunction while in bed or as a throw blanket while you’re on a couch or chair. Also referred to as a gravity blanket, therapists, as well as psychiatry clinics, use weighted blankets. Weighted blankets provide you soothing, calming comforts that you would expect from a regular blanket but also combine a therapy tool pioneered by Temple Grandin, an austism researcher. During Dr. Gradin’s research, she found that when cows being led with a compression device to hold them still (for vaccinations) were more calm and docile. Dr. Grandin, who was also on the autism spectrum herself, recalled the positive effects of being hugged and held as a child to reduce anxiety. Seeking a solution that provides this calming physical feeling without an overwhelming sense of being confined and restricted she created the ‘squeeze machine.’ Like a hug, the squeeze machine applies concentrated gentle pressure throughout the body. This was found to release oxytocin (the happiness chemical). As modern technology has advanced from the original squeeze device yet parents have found the price ranges for these devices substantial reaching into the thousands of dollars. 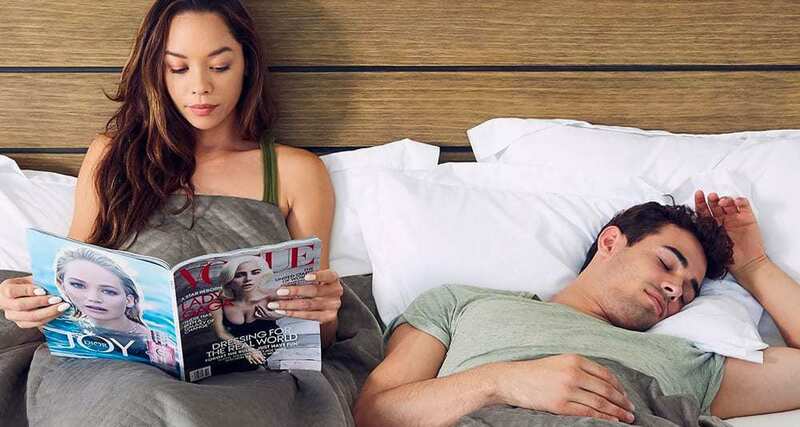 The solution – a weighted blanket can offer deep pressure stimulation, similar to that of a massage, firm hug, or swaddling but at an affordable price point. Also, with budget-friendly weighted blankets now the general public can benefit from this research that started for autistic kids but is now benefiting thousands of people with other conditions such as anxiety and stress. It’s essential that weighted blankets are NOT USED for babies and toddlers. Instead, parents and caregivers should follow the recommendations by AAP to reduce the risk of SIDS (sudden infant death syndrome) and other sleep-related injuries and death. Now that you understand the science behind weighted blankets here’s how they might help with medical conditions. According to Gaby Badre, M.D., PhD, who works as an associate professor at the University of Gothenburg as well as the medical director of the sleep disorders clinic in Sweden, the pressure that you will get from using a weighted blanket gives that reassuring and cocoon-like feeling as well which helps with deep pressure stimulation. In a study co-authored by Badre, four out of five of their 31 adults felt an improvement to their chronic insomnia. Badre further explained that the weighting material that was found inside the blanket gives that light and stroking type of tactile sensation that feels similar to being caressed. This may help boost the production of serotonin and melatonin which are both needed for you to feel calm and relaxed and ready to drift off to sleep. Anxiety disorders affect millions of individuals around the world. In the US, about 40 million adult Americans are suffering from anxiety or panic disorder. Stress is a common trigger for anxiety. For those who have anxiety attacks, among the symptoms that may be experienced include high blood pressure and insomnia. Weighted blankets can help provide restorative sleep, well-being, and calming experience too. Weighted blankets reduce anxiety symptoms can help reduce anxiety for those at home or on the road. Post-traumatic stress disorder or PTSD is usually associated with soldiers who were in combat. But this condition can happen to anyone who has experienced a scary or life-threatening situation. Those who have PTSD may also develop other disorders such as anxiety, depression or obsessive-compulsive disorder. Post-traumatic stress disorder patients often have this feeling of imminent danger even when they know that they are safe. PTSD can trigger high blood pressure, rapid breathing, and elevated heart rate. It can make you feel exhausted, irritable, as well as depressed. How do weighted blankets work in cases of PTSD? Well, the deep touch pressure stimulation that is associated with this type of blanket can help relax a person’s central nervous system. It is believed that the use of weighted blankets can help with those on the autism spectrum, Dr. Temple Grandin, who is also on this spectrum, developed the “squeeze machine” which was first used on cattle who get vaccinated. Dr. Grandin was able to determine that the hugging machine provided a calming sensation to the cows. She then applied this theory to autistic patients which proved to be correct. She noted that the machine helped users feel calmer and more relaxed, plus they become receptive to touch as well. Their anxiety levels have gone down as well which helps patients too. Weighted blankets use the same concept as Dr. Grandin’s machine, but this time in the form of blankets which can be used on a day-to-day basis. Sensory processing disorder is best described as having a “traffic jam” in your brain. Although several signals reaching the brain, they get blocked while traveling. This is one of the reasons why children and adults may experience the feeling being overwhelmed without an obvious reason. This can lead to meltdowns in children who cannot explain verbally how they feel to their parents or other adults as well. The weight of the blanket can help people become used to the touch without feeling overwhelmed afterwards. Chronic pain, such as fibromyalgia, impacts the daily life of it’s sufferers. Not only can the fatigue be overwhelming, but it can also cause “fibro fog”, GI and urinary issues, and of course, depression and insomnia. Weighted blankets help increase the serotonin levels in the brain which can aid in alleviating symptoms and lead to more restorative sleep. Do weighted blankets work? If you are still unsure of whether having weighted blankets can help you get a good night’s sleep, here are a few benefits associated with it. Those who have insomnia or anxiety may find that they can go to sleep faster because of the weighted blanket. The weight of the blanket gives you that comfortable and a hugging feel at night. It is also possible that weighted blankets can help banish your anxiety away because the weight helps you to feel grounded. Those who have used this product noted that they feel cocooned inside the blanket as if they were back in their mother’s womb. Another benefit that is associated with a weighted blanket is that it can help you sleep longer. Due to the weight of the blanket, it makes you more conscious of your movements, so you may be less likely fidget when you are in bed. This may help you not wake yourself up, and you can stay asleep. Weighted blankets are typically used in beds. Hence, they are often associated with better sleep and even feeling calm and relaxed at night. But did you know that they can also be used to help you become more focused during the day? Students who have attention difficulties or are hyperactive became more focused when wearing weighted vests during the day. This can allow them to function better and produce better results. This is why those who have ADD or ADHD were often recommended to use a weighted blanket as it can help them feel calmer and more relaxed to do the tasks before them. Most of us try to avoid the use of medication. When you are feeling anxious, stressed out, suffering from depression, or any stress disorder, weighted blankets may are one of the tools that may help you least alleviate the symptoms without the use of prescription medications. Always speak with your doctor before changing any medical plans. All claims and facts on our site are not to be taken as medical recommendations. They are based on 3rd party studies.